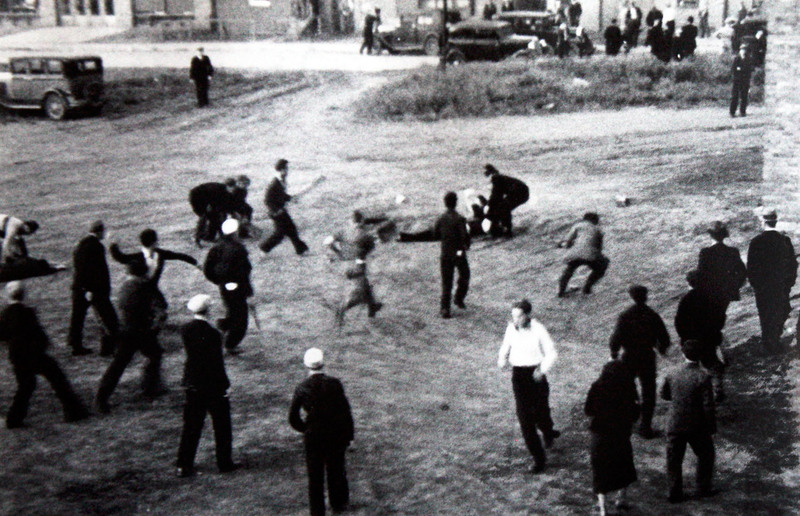 Seventy-five years ago, Regina, Saskatchewan was still reeling from a brutal riot on Dominion Day that left one protester and one city police officer dead. It was the Conservative government of the day’s answer to the On-to-Ottawa Trek, in which thousands of unemployed men were attempting to cross Canada to the nation’s capital in order to bring their grievances directly to Prime Minister RB Bennett. They were demanding that the federal government dismantle the relief camps that had been set up in remote areas by the military to warehouse the throngs of unemployed men away from urban centres. The Regina Riot, showing Constable Alex Hill lifting the body of Detective Charles Millar. Trekker Nick Schaack was the other fatality of the riot. Despite being outlawed, Communists organized camp inmates into the Relief Camp Workers Union and called a strike for April 1935. 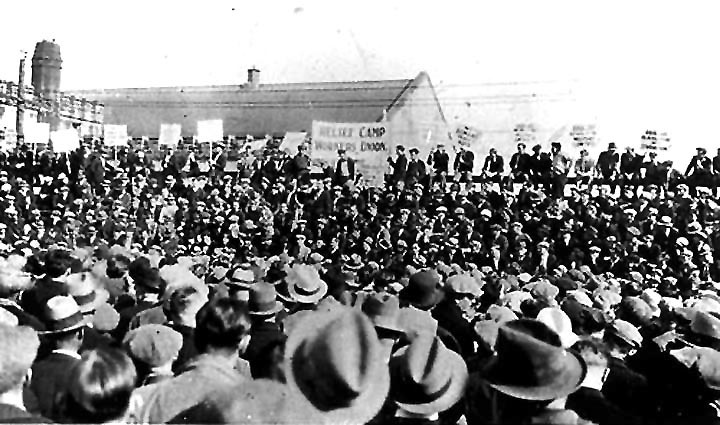 The largest number of camps was in British Columbia, and about 1700 camp strikers hopped on trains and headed to Vancouver. The strikers spent two months in Vancouver before trekking off across the country. Their time in the city was remarkably peaceful in light of the circumstances. 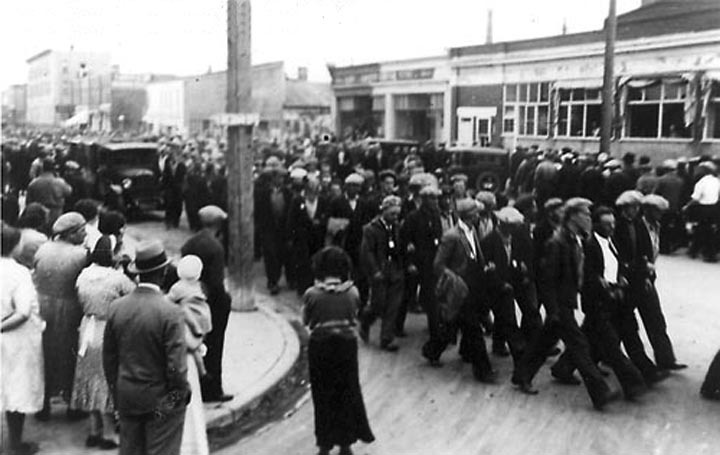 To be sure, there were some tense moments and occasional violence, but nothing like what would happened in Regina despite the large armed force that was assembled in advance of the strike, which included contingents of RCMP and provincial police, fascist vigilantes, and special constables. The city police also set up an elaborate intelligence system and acquired machine guns, tear gas, bullet proof cars, and electronic surveillance technology. Nevertheless, the worst violence was a skirmish at the Hudson’s Bay Department Store after the police came to eject protesters. There were some injuries and property damage in the store, and the mayor read the riot act at Victory Square. Later that day, there were some police raids, another protest on Hastings that the police broke up, and a delegation that went to meet with the mayor was arrested, but the situation did not significantly escalate. It’s not that the powers-that-were didn’t want a showdown with the protesters. On 9 April, less than a week into the protest, the Vancouver office of the Department of National Defence wrote to Ottawa that Mayor McGeer “reports he is in a position to cope with situation and wants showdown as soon as possible.” For his part, the Chief Constable, Colonel WW Foster, would lead the police in a bloody showdown on 18 June, but that was against striking longshoremen after the unemployed had already left the city. 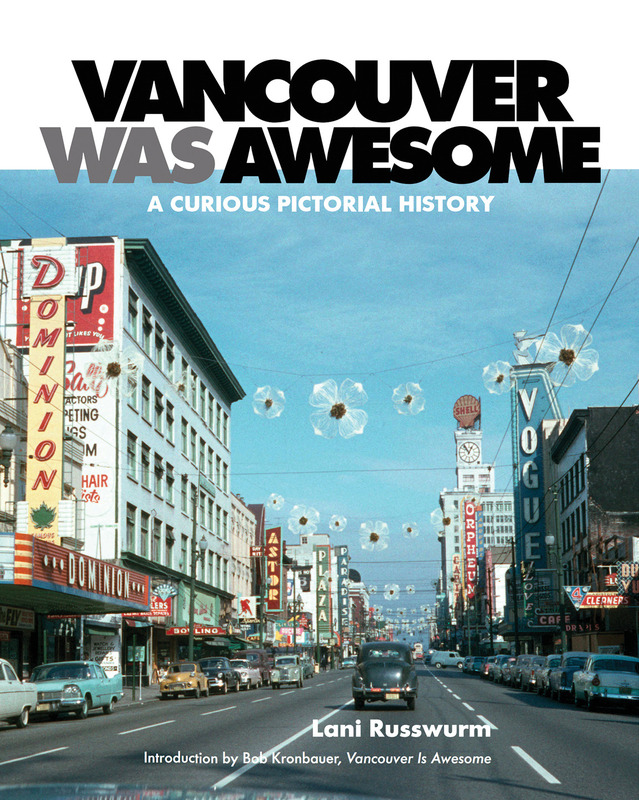 So why was there no major battle between the police and the unemployed in Vancouver? Colonel Foster drew some significant conclusions from his initial threat assessment of the situation. First, despite the Red leadership of the camp strikers, the vast majority of the unemployed were not Communists looking to overthrow capitalism. Secondly, he believed the unemployed had a legitimate beef with the relief camps. He found it significant that they weren’t calling for the typical union strike demands of higher wages, better working conditions, or more say in how the camps were run. 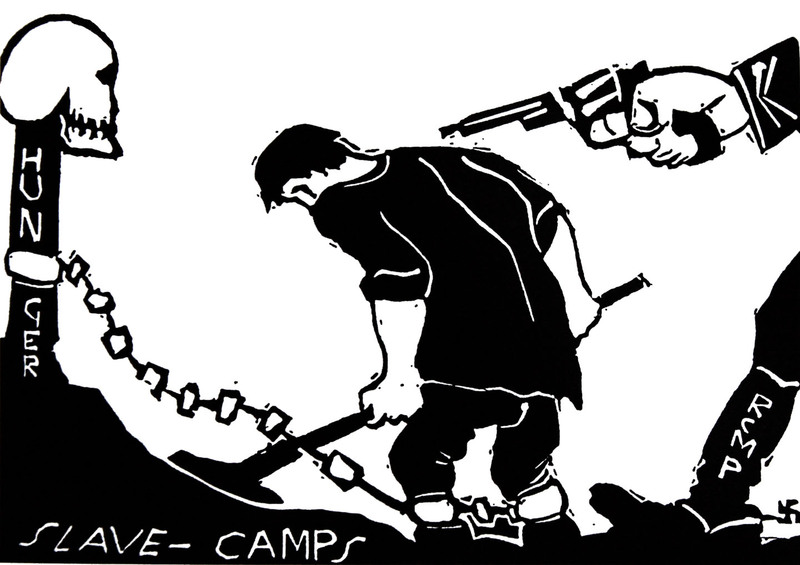 Instead, they wanted the camps abolished and the government to implement a “work and wages” program. Finally, the longshoremen were also led by Communists at the time, and they were gearing up to shut down the waterfront in their fight for greater worker control and better wages and working conditions. This was the real threat in Foster’s view, not the unemployed. Colonel Foster also learned from his police spies that the Communists were planning to merge the waterfront strike with the relief camp strike in the hopes that it would spark a full-blown general strike. Accordingly, police should be relatively tolerant of the camp strikers and encourage them to leave the city. Unnecessary confrontations with the police, Foster felt, would only make camp strikers more amenable to the objectives of the Communists and more open to joining a general strike. I can say that he was polite, courteous, never raised his voice, and I formed the opinion that a bourgeois officer in the British Army of those days did not have the necessary brutal fortitude to serve the ruling class in the fascist political conditions of that day. 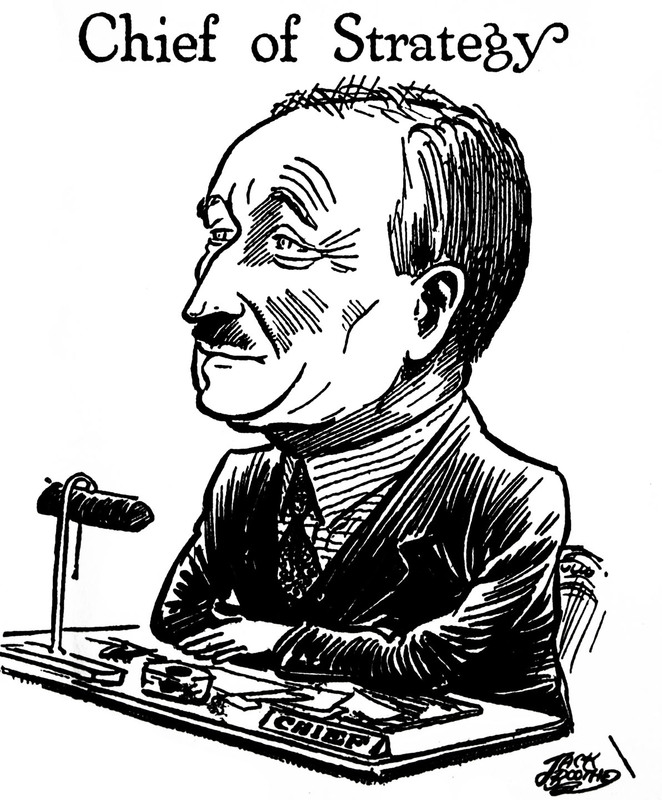 Resistance to Colonel Foster’s policing strategy came from within the police establishment. Besides the combative Mayor McGeer, opposition also came in the form of criticism by Inspector Forbes Cruikshank, the head of “E” Division of the British Columbia Provincial Police (BCPP). Cruikshank wrote a lengthy memo to his boss in Victoria complaining about Foster’s kid glove approach to the relief camp strikers. It seems to me the City wish to get-by as quietly as possible. Although it is advisable to have things go along as peacefully as possible still, in the present situation, we can certainly pay too high a price for this and, in my opinion this whole affair must be handled in a firm manner and the longer conditions are allowed to exist as they are at present the more difficult it is going to be, as the strikers will increase in numbers. If some definite action is not taken it will not be long until this mob will be in control of the city. The men who made up this parade appeared to me to be looking for trouble, but they made no attempt to attack us. I asked of the City sergeants why this crowd should not be broken up and he said he was waiting for instructions from his Inspector. I was instructed to take my men back to the City Police station by Insp. Mortimer of the City Police. Our men took no active measures yesterday, at any time, and I received no instructions to break up the crowd and, as stated previously, I could see no reason why we should not have taken some action, with whatever force was necessary, to control the situation. I understand that the strikers wanted two days relief and about 200 or 250 took possession of the Museum, above the Library, locking the doors and putting everybody out. 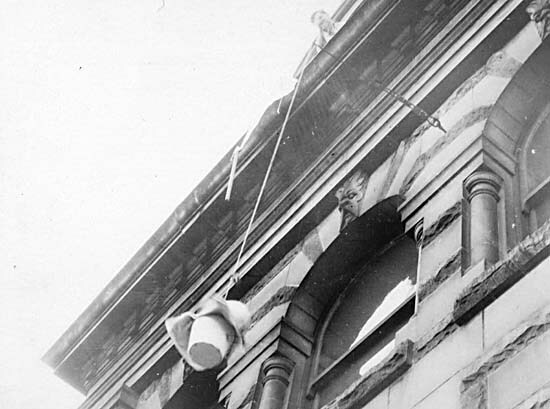 These men were allowed to pull sacks of bread, milk cans and other supplies through the windows. The supplies were handed to them by the crowd on the street. I am aware of no effort being made to disperse the crowd. I was informed that Col. Foster went to the museum and later on he went again, about 9:00 p.m. and made arrangements that the men would get two days relief. The men then came out and marched away in a body. During the afternoon, when they were considering the situation of these men in the museum, I suggested to the Deputy Chief that if they wanted to get the men out of this public building gas could be used. However, the Deputy stated that there would be damages to property and they did not want that to happen…I was also informed that after the relief had been granted for the two days, a man spoke to a gathering at Victory Square saying that a victory had been won and that they would now have to take possession of Public buildings in the City. Among the public buildings mentioned was the Court House. Some days ago when we raided 318 Cordova St. and 92 Hastings St. E. I observed that 318 Cordova, which is the top floor of a store building, was in a terribly filthy condition, and I understand that about 200 or 250 men sleep there. There is only one wash basin and one toilet in the premises. At that time I suggested to the Deputy Chief that these premises should be closed up by the City Health Dept., and his answer was in the form of a question. “Where would they go”? Whilst our men were there the crowd kept up a continual “booing” of the Provincial Police. While this does not bother us still, it shows the feeling of the “mob” towards the B.C. Police. The strikers do not follow this practice with the City Police. In the 1930s, there was still a clear distinction between a civilian police force and the more militaristic colonial forces like the RCMP and BCPP. Labour activists characterized the latter as strikebreaking and oppressive “Cossacks,” whereas unionized city police typically didn’t set out to break strikes. In one sense then, Foster was simply following policing tradition. More significantly however, despite being a staunch anti-communist and anti-unionist, the colonel strategically rejected the belligerent impulses of his colleagues, knowing that tolerating protests did not amount to ceding control of the city to a mob. In closing his memo, Cruikshank asked that the Attorney General pressure Ottawa to release the tear gas he had ordered from the US that was being held up at customs.